Q&A Time! What is the Overlap Between SMT and MDT? Today's Q&A comes from Dr. Ben Swinehart, DPT, What is the overlap between SMT and MDT? This is a great question Ben, and one that exclusively OMPT practitioners and MDT practitioners would probably like to think is not as simple as I think it is. One of the MDT Diplomats says, "End range is where the magic happens." I use this often when I am teaching OMPT and when prescribing MDT based exercises to my patients. The best MDT outcomes come from assertive and educational providers who instill the patient with the ability to self treat. I see Diplomats especially able to turn dysfunctions or slow responders into derangements or rapid responders better than most. This is where the overlap is, assuming a motion or position is not helpful to a patient because it "hurts" may lead to slower progression or abandoning a technique before you should. End range is the overlap. Some patients are great candidates for manipulation, especially those that think they will benefit from it. An award winning study found that patients who met the CPR for lumbar manipulation could also be classified as a derangement syndrome under the MDT system. This makes sense because both should be rapid responders and especially derangements 1 and 3, or posterior and posterolateral with symptoms radiating to above the knee without deformity are generally healthier and easier to treat. Another study looked at lumbar patients with Sx duration > 6 weeks. Both the SMT and MDT groups good outcomes for disability in the long term 1 year follow up, however the MDT group had slightly better results in terms of disability. This makes sense as MDT educated patients typically get the preventative education and their own self "audit." Check to see if your previously limited motion (the DP) is blocked by regularly doing your exercises. If it is, you need to double down and be more diligent for a bit. Typical OMPT patients do not get as much prophylactic education. One of my earliest posts was using MDT and OMPT to make a patient fit the CPR. I interpret it liberally. If a patient has two hips that are very restricted, I use IASTM/FR to the hips to make at least one move better, I also use MDT and neurodynamics to centralize a patient's peripheral complaints. If they are still within the 16 day period (or have an acute exacerbation of a chronic complaint), I manipulate them. 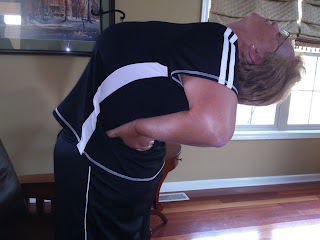 This often leads to increased pain free extension (or whatever the DP is) and that leads to increased compliance. End range is where the magic happens, whether it's mechanical as in reducing a disc derangement, which has been proven radiologically with minor disc protrusions, or by firing type 3 mechanoreceptors by hitting end range, thus bombarding the CNS with proprioceptive information, the overlap is both systems get patients to end range. You can jump patients in and out of each treatment system as needed, but my preference for HEP and prophylaxis is MDT for it's simplicity and reliability of classification. Here's a good family friend of ours, met all the CPR rules for successful outcome, she was doing extensions, but not often enough and going to end range. She felt much better after two lumbar roll manips, but then had to be instructed to place her thighs against a chair/table, then extend until she felt like she as going to fall over. Prone press ups did not get her to end range unless she would prop her hands onto something to give her more end range. End range... end range... end range... end range!